Help required with this photo please. Warrington Walking Day 1911, the procession is winding its way along Church Street having just passed Orchard Street, the sign on the wall of Chamberlins Chemists Shop is advertising " Holloway's Pills & Ointments" a cure all for most human ailments. The pub The Gladstone Arms is on the opposite side of Orchard Street and has the Union flag flying from the top window. There is a tricoulor flag flying from a bedroom window incorporating a small Union flag in its corner, any suggestions as to what flag this is, I thought it may have been the Irish flag but this wasn't used by the Irish Rebels until 1916 and the photo is 1911. Any suggestions please. The Irish flag has Vertical stripes alg. 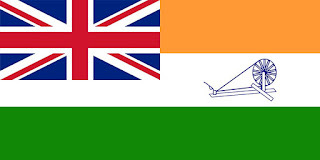 It looks remarkably like the proposed flag for India, excepy that was much later. I haven't got a clue Algy. Shame it's not a colour photo. I'm presuming it was red white and blue or two other colours (darker on at the bottom with white in the middle). I've tried googling but can't find anything but will keep looking. Could it be that the shop owner was foreign so they made their own incorporating their flag and the Union Jack ? Saying that 1911 I guess people didn't do that sort of thing. So it is Wolfie, what am I like!. Dizz you could be on to something those three colours could be red, white and blue?. But looking at the shades in Wolfie's India flag too they could quite easily be orange white and green (orange would show lighter than green in greyscale/black & white). But like he said that flag was later. Who's to say the photo is dated correctly??? Algy can't remember when he took every photo you know!! Not sure if this helps at all but it's an old video of Warrington Walkings day in 1902 from the 'Getty Images' website. There are kiddies carrying flags and some have Union Jacks' in the corners although not the same as the one in the photo but not ones I've ever seen before so I don't know why they would be carrying them and what the relevance was to the country or whatever they were for. I tried to watch it full screen and more closely in case I'd missed one like that in the photo with the intention of taking screen print copies too but I have too much open on my computer so it's grinding to a halt. If you go by the picture It appears that they did personalise flags at that time, the flag on the left is one I have never seen before it has the cross of St George with stars on the cross, the one on the right looks to be the Australian flag though. Is it possible the flag was related to a colony in the days of the Empire but could have been changed when the country became independent? Re your photo above Algy and the flag on the left with stars could it be this one, the Australian Federation Flag. Says 1831 though but maybe that's when they started using it. ...or maybe not as I've just looked again and I think it has less stars on it. my thinking was that it may be a scout flag or a boys brigade one. the one in the top picture could be an early british legion flag. They have a union flag in one corner and are blue with a yellow stripe, normally they have the name of the area on the yellow stripe. the one with the stars in the second picture on the right could be Australia. found this site and there is a flag shown that looks similar to the cross with stars on. Is the flag at the front upside down? ?